For more information about this event, please contact Hong Kong Photographic Culture Association Ltd at epayment@hkipf.org.hk. "Aristotle’s Hole - From Mo Tzu to the Selfie Stick"
Over 2500 years ago, the philosopher Mo Tzu observed sunlight travelling through a small hole and deduced that light travelled in a straight line like an arrow being fired. The talk will cover the 500 million year history of pinhole imaging, its science, and immense variety of contemporary approaches to pinhole photography. Creating images without a lens. Justin Quinnell is considered to be one of the world experts in pinhole photography which he has taught for over 25 years in the UK, US and Australia. 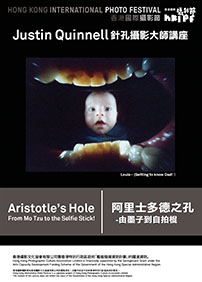 His important work includes ‘Mouthpiece’, images from inside his mouth. He was pinhole photography consultant for the Rachel Weisz– Adrien Brody movie ‘The Brothers Bloom’ (2008) . Participants of the talk may have the chance to win pinhole cameras handmade by Justin Quinnell, details of which will be announced during the talk. Please call 2777 1955 or email: epayment@hkipf.org.hk for further inquiry. Hong Kong Photographic Culture Association Limited is financially supported by the Springboard Grant under the Arts Capacity Development Funding Scheme of the Government of the Hong Kong Special Administrative Region. Hong Kong International Photo Festival is a signature project of Hong Kong Photographic Culture Association Limited. The content of this activity does not reflect the views of the Government of the Hong Kong Special Administrative Region. Justin is considered to be one of the world experts in pinhole photography which he has taught for over 25 years in the UK, US and Australia. His extensive portfolio includes: ‘Mouthpiece’, images from inside his mouth, ‘ Slow Light ’, 6-month exposures and recently the ‘Awfullogramme’. He was pinhole photography consultant for the Rachel Weisz– Adrien Brody movie ‘The Brothers Bloom’ (2008) and used this year as a consultant for Science Museum, London. UK publicist for world pinhole day since its inception 15 years ago, he lives in his hometown of Bristol in the UK with his wife Chrissy and two children, Louis and Rosa.